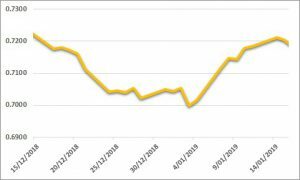 Sugar prices rebounded further into higher territory over the past week. Despite some sideways price action, specs helped drive sugar into positive territory overnight. 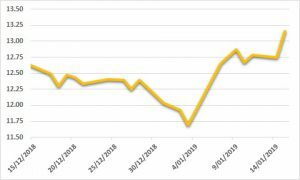 The US Federal shutdown stopped the weekly Commitment of Traders report, however, respected market analysts presume specs sit at a comfortable net short position. The overnight price action suggested a sudden shift (short covering) by specs. Elsewhere, oil rallied to sit comfortably on a USD 50/barrel handle—thanks largely to OPEC production cuts. In India, exports were trimmed as potential for an increase to the minimum selling price continue to be lobbied for. Indian production at the end of December was pushing above 11 mmt (7% higher year-on-year). Many are still assuming Indian production will underwhelm, which may prove to be incorrect. Looking forward, we will be carefully monitoring Indian production and exports, until we see further developments on levies. Another strong week for the AUD, pushing back toward USD 0.72, with the FOMC meeting minutes continuing to show the Fed’s reluctance to hike rates in the near-to-medium term. Many still expect the Fed to hike twice in 2019, however, no change is expected until the second half of the year. Global trade risk sentiment began to build positively over the weekend—Chinese economic officials are expected to progress with discussions in Washington next month. The week ahead is a quiet week for domestic data, whilst some key US data will be withheld, given the Federal shutdown.